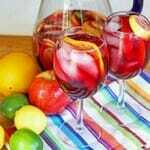 This Virgin Sangria is a great summer time drink! It’s easy, it’s quick, it’s delicious and refreshing. Kids and adults love it, you can snack on the fruit. What’s not to love, right? Core the apple and cut it into 8-12 slices. Place the slices in a serving pitcher. Slice the lime, lemon (seed it), and orange and place them in the in pitcher. Juice another lime and lemon and add the juice to the pitcher. Add the apple juice concentrate and grape juice. Chill until ready to serve. Immediately before serving, add the sparkling water or club soda and serve over ice, trying to get some of the fruit into each glass.